loving this look for Autumn! 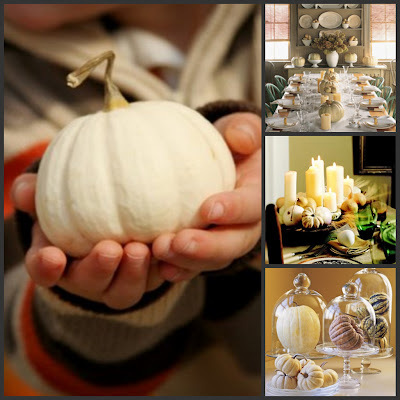 Pottery barn has white pumpkin candles! Cute idea, just add a little black paint, or stickers! decorate your tables with them! the look is so beautiful! I think I have to get me some! 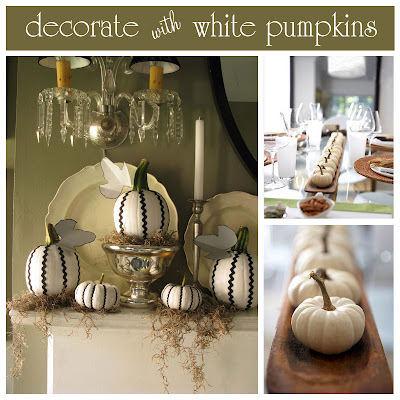 I love those white pumpkins! I have to get me some too! Love those pumpkins, especially the ones with the rick rack... I will have to use that idea! I love them...mixed with the orange ones too..but these really are so lovely! I love white pumpkins - all your photos are so beautiful. Adorable blog...so glad I found you! I just love all pumpkins.. but the white ones are so pretty. I can picture all white pumpkins in your house especially in the new room. Beautiful shots! Just saw a ton of white pumpkins at the market, I always long for them for a couple of weeks then give in and buy them! The pictures are beautiful ~ if only I could find enough of them to decorate my table. I love those intricately detailed white pumpkins. I picked up a few white ones at target...they are really nice looking as well! 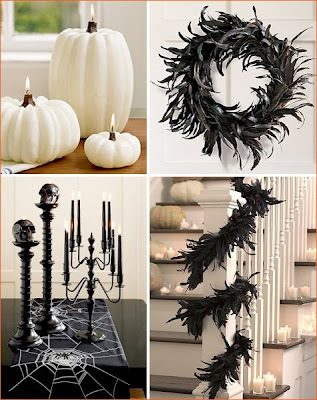 Okay...Now I have MORE pumpkin crafts to do!!! 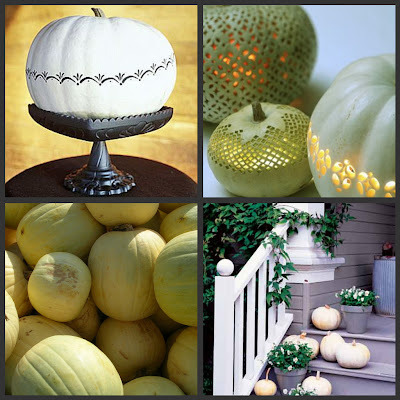 Hmmm...my house MAY end up looking like a pumpkin patch BUT these white pumpkins are so gorgeous!! Love these ideal's love them! I am so ready for the ecomony to bounce back, so one can get back to enjoying all the things we have worked so hard for, insteady of worry about how to keep them! This takes your mind off all your worries and helps you to go to a happy place!! Thanks for the inspiration! Saw Phyllis Hoffmans Celebrate Halloween at Barnes & Noble today. Thought of you... a great magazine.. great idea for a halloween party... if you havent seen it.. you should look into it. A really nice magazine..
i love,love,love these white pumpkins! but more than that i love that i found u! !lol u r truly a amazing designer i hope to hire u in the NEAR future for a consultation! i was wonderin if u have any tips on doin the black distressed look on furniture?what brand of paint,best way to apply it and distress it?i have some old oak pieces i would love to revamp and get out fo storage!tellin everyone i know about u your the best thanks! Love all those ideas,but I especially love the one's that spell out "Thanks"! Thanks for sharing w/ us! Gorgeous inspiration. I can't wait to make the switch to Autumn. 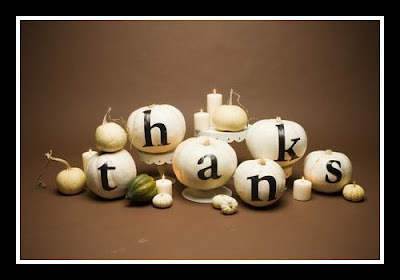 Hi - I am the creator and stylist of the white pumpkins that spell "thanks" in this post. The image is owned by The Arizona Republic newspaper, for whom I created the photos. Please credit us properly and link to the newspaper's website if you'd like to keep the photo up here, OK? Thanks.